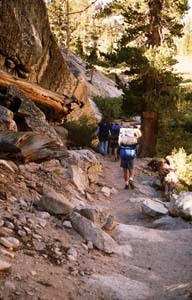 The Mt Whitney Trail is a well maintained 11 mile foot path to the summit of Mt Whitney. The trail begins at 8,360 Ft, and ends at the 14,508 Ft summit of Mt Whitney. This places the total elevation gain at 6,137 Ft. I would rate Mt Whitney as the third easiest of the fifteen California peaks (that soar above fourteen thousand feet) behind White Mountain and Mount Langley. The Whitney region includes the Sierra crest from Shepherd Pass to Cottonwood Pass. Mt Whitney (due to it being the tallest peak in the continental United States) receives the heaviest traffic by far of all the peaks in the Sierra Nevada, and people come from all over the world to tackle Mt Whitney via this famous trail. There are very few trails in the Sierra Nevada that take you all the way to the summit, and the Mt Whitney Trail is the only one in the Sierra Nevada that gives you direct access to a 14,000 foot peak without any scrambling involved, and because of this, it has a steady class one rating (for more about hiking and climbing classifications, see our page on Climbing). The Whitney Region contains some of the highest peaks in California, as well as some of the most exciting terrain in the Sierra. Deep glaciated canyons, cirques, hanging valleys, sharp ridges and high passes make the Whitney region, and all these features add up to something special when it comes to high adventure. Once you have finished making all your last minute preparations and taken that group send off photo at the Whitney Portal Trail Head, you are ready to get started on your adventure. You begin your trek at the lower end of the parking area loop of the Whitney Portal Road, and after a 100 yards or so, you will find yourself gradually hiking up the north slope of the canyon. This section is of the trail is fairly easy and smooth (in comparison to what is to come later on). In early season the lower section of the trail is graced with beautiful green ferns and other plant life as seen in the photo to the right. Later in the season things dry out and your surroundings are not quite so lush. About a mile up the trail, you will come to a trail marker that points the way to the North Fork of Lone Pine Creek. If you are tackling one of the East Face Routes, the Mountaineer's Route, or are climbing Mt Russell, then you do not want to miss North Ford of Lone Pine Creek turnoff as shown in the photo to the left. I have met up with people that have ventured well up the North Fork who thought they were on the Mt Whitney Trail, and also with folks that were well on their way up the main trail, only to find out that they missed the turnoff for their intended trip up Whitney's Mountaineer Route. So pay close attention to this trail marker located at about the one mile point. It's no fun wasting energy going up and down this section of the mountain just because you took the wrong fork in the trail. I have been up both forks several times, and I have to tell you, that the North Fork of Lone Pine Creek is nothing like the Main Mt Whitney Trail. The North Fork is much rougher, and if you get off course you will find yourself doing some nasty bushwhacking in the lower section (along the infamous creek bed). The image to the right shows what comes right after passing the North Fork of Lone Pine Creek trail marker on the main trail. It is a small stone crossing of the Lone Pine Creek drainage. If your intention was to turn off the main trail and proceed up the North Fork and you find yourself in the photo to the right, then you have just missed the turnoff. 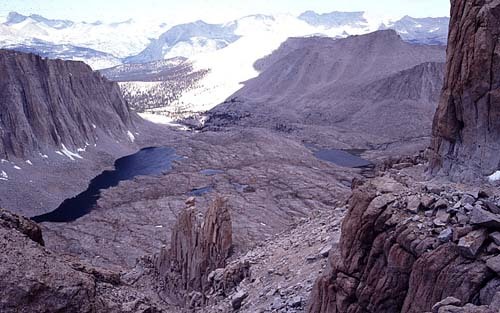 Shortly after the crossing of Lone Pine Creek, you will enter the John Muir Wilderness (as shown in the photo just to the upper left). The John Muir Wilderness extends along the crest of the Sierra Nevada, for approximately 100 miles, in the Inyo and Sierra National Forests. Established in 1964 by the Wilderness Act, and named for naturalist John Muir, it contains 581,000 acres. The wilderness extends from Reds Meadow (near Mammoth Mountain) in the north, to south of Mount Whitney. The wilderness area also spans the Sierra north of Kings Canyon National Park, and extends on the west side of the park down to the Monarch Wilderness. Below we have a map showing the trail in it's entirety for you to check out. It includes all the major land marks. The next big landmark coming up at the 2.8 mile mark is Lone Pine Lake. This beautiful Sierra Lake is situated at 9,900 Ft of elevation. 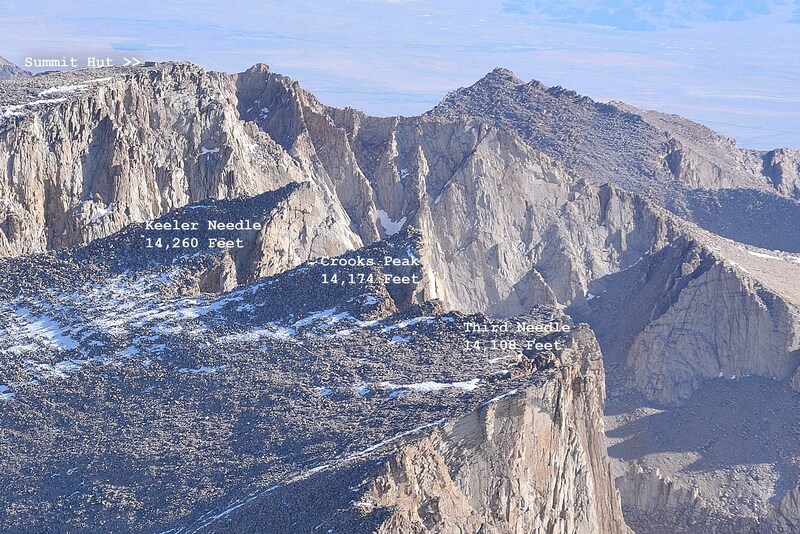 You have now gained 1,560 feet or almost a quarter of your total elevation gain to the top of Mount Whitney. You will know that you are very close to Lone Pine Lake by the cool split log crossing shown to the left. It has been around since I first climbed Mt Whitney in the early 1970's and was still there on our June trip in 2007. Lone Pine Lake (shown in the below right photo) is a great destination for kids who are just getting started in the outdoors. It is only 2.8 miles from the trailhead, and affords super camping areas not far from it's shores. (remember to camp at least 100 feet from any water source) You also do not need the hard to get Mt Whitney Trail Permit, if you are going no further then Lone Pine Lake. (but you still need a wilderness permit if you intend to spend the night). Kids will love the adventure, and it is a great way to introduce them to the wilderness without having to push them up something that is too difficult for their little legs (like trying to go to the summit of Mt Whitney). I have found that if you introduce your children to the outdoors and make it easy and fun for them in the beginning makes a lasting impression that keeps them coming back. There is always plenty of time to introduce them to more difficult adventures as they get older. To get to the shores of Lone Pine Lake, you will need to turn off the main trail (at the trail marker shown to the left), and take a short hike down hill. My wife and I spent many outings backpacking up to Lone Pine Lake for the weekend and greatly enjoyed it. Being out in the wilderness at Lone Pine Lake was a fantastic way to take a short break from the hustle and bustle of city life. Note the huge thunderhead forming in the background of the image above and to your right. The ominous clouds are developing just above Owens Valley at an elevation of about 5,000 feet and have now risen above the 10,000 foot level. Needless to say, we had a torrential rain that night, but heavy rainfall only added to the excitement. We were well prepared to weather the storm with our four season tent. We started the day with beautiful pure blue skies but ended up with heavy thundershowers by nightfall. This is why you need to always carry rain protection with you on Mt Whitney or any wilderness terrain. You never know what will develop as the day rolls on, and as signs located at the Whitney Portal Trailhead warn you, weather can change very quickly when you are in the mountains. Shortly after passing by Lone Pine Lake, you will be greeted with the sign (shown in the photo to the left), warning you that you are entering the Whitney Zone, and that a special permit is required for all hikers and overnight backpackers. If you do not have the proper permit, and the Ranger catches you, (very likely) then you will be escorted off the mountain and possibly fined. So make sure you have the proper paperwork with you at all times. 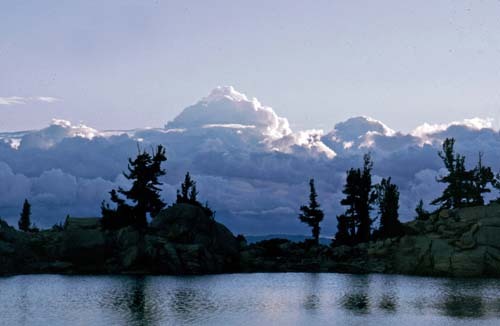 Once past Lone Pine Lake, it is only one mile further to Outpost Camp. This camp is located at 3.8 miles from the start, and at an elevation of 10,400 feet. As you approach the beautiful meadow where Outpost Camp is located, you will find yourself descending a bit before reaching the meadows below. Established campsites are located at the far end of the meadow, so continue to hike along until you reach these sites, if your plan on spending the night here. Outpost camp is a great place to spend the night if you want to gradually acclimate to the altitude so that you minimize your chances of getting Altitude Sick. It is also a great place to take a break if your plans are for doing Whitney in a day or pushing on further up to Trail Camp at 12,000 feet. Outpost Camp -has fantastic well established sites that are wonderfully level and they have a nice sandy base. This makes for easy tent setup, and comfortable sleeping. There are several of these sites, so finding one should not be a problem except on the highest volume weekends in July and August. Also note the sign to the right informing you that there are no wood fires allowed. You could imagine if they allowed gathering wood and making fires. There wouldn't be a tree left in camp !! There is also a good water source for most months of the year, but it still must be filtered for safety. The camp is down stream from the heavily populated Trail Camp above, so drinking straight out of the streams is not an option. Make sure that you treat your water either by boiling it, filtering it, chemically treating it, or any combination of the aforementioned. For much more on the subject of water treatment and the effects of dehydration, check out our page on Water/Dehydration. At Outpost Camp, you are still surrounded by imposing granite walls. In the photo to the left, you see Thor Peak at 12,300 feet towering above camp in the background. But once you reach the summit you will look down on Thor Peak like it was no big deal. As you proceed up the trail (after your visit to Outpost Camp), you will be able to look back and get a great view of the meadows below (as shown in the right hand photo). Having extra time on Mt Whitney will enable you to take time out to enjoy these camps. So many people are in such a rush to make the summit that they are hardly able to take time out and enjoy the magnificent surroundings that Mt Whitney has to offer. This is the way I was in my younger days, all I wanted to do was get to the summit so I could say I conquered Mt Whitney. But at this stage in my life, the getting there is what is most enjoyable for me. Next point of interest only 0.2 miles and 240 vertical feet further up the trail from Outpost Camp is Mirror Lake (located 4.0 miles from trailhead at 10,640 feet). Mirror Lake is basically for viewing only since camping has (and still is) prohibited . This regulation was in force ever since I can remember in the early seventies. The area must have been badly overused in earlier years, and is a testimony to how long it takes for an area to recover once it has been abused. The trail skirts this lake at a slightly higher elevation point, and I rarely have seen anyone go down and explore it's shores. After Mirror Lake, the trail turns rocky and gets down to serious business (above left image). There will be many steps to negotiate, and you will soon be above timberline where trees are no longer able to grow due to the environmental conditions of high altitude. This is also the point where most people begin to feel the effect of altitude on their bodies. Make sure to get plenty of water, and do not rush yourself. Altitude has a way of sucking water out of your body, and dehydration along with exhaustion is a good way to get sick. So take it easy and concentrate on proper breathing and water intake. 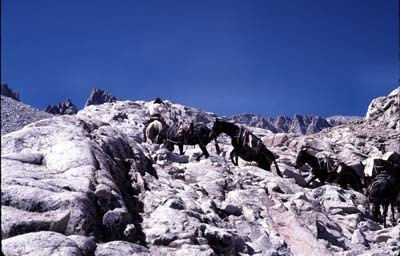 Years ago while hiking up Mt Whitney, I took this picture of horses and mules ascending the trail between Mirror Lake and Trail Camp. One can certainly learn a lesson from these creatures. They are slow but steady, but they soon outpaced us and disappeared. One mistake people make in the mountains is setting too fast a pace for themselves or their party. Far better to set a pace that you can maintain all day with few stops, then to rush along and take breaks every 15 minutes or so. I will never forget long ago while doing Mt Whitney with my dad rushing from point to point so fast and getting to Trail Camp in record time only to sit down exhausted and unable to go on. We were soon passed by a man whom we had nearly spun in circles when we passed him lower down on the trail. As he passed us later on as we were gasping for air, he turned and said to us..... "boys, I told you....take it slow and easy.....one step at a time. That's the way to make the top" That man was over 70 years old while I was in my early twenties. I never forgot that advise, and it has served me well over the many years I have been mountaineering. At the 5 mile point you come to beautiful Trail Side Meadow. You are not allowed to camp here, but it is a great place to rest those tired bones while enjoying some of the most wonderfully lush scenery on Mt Whitney. At 11,400 feet, the trees are gone, but the stream fed greenery helps make this rest stop well worth while. If you are low on water or need to fuel up with lunch or just have a well deserved snack, this is the place to do it. We choose this location for our lunch stop and we thoroughly enjoyed it. Trail Side Meadow in early season is a virtual playground. The meadow area is also home to a beautiful meandering stream as shown in the below left hand image. Be sure to minimize your impact on this fantastic meadow so that others will be able to enjoy it in the future. It is areas like this that add so much to the experience of hiking up Mt Whitney. We took four days out to do Mt Whitney, and it gave us plenty of time to just relax and have fun. So if you can get the time off, you can really enjoy the many special rest stops and camps on Mt Whitney. It also gives you more time to acclimate so you can feel much better in the long run and minimize you chance of getting altitude sick as mentioned above. As you proceed up the trail after Trailside Meadow you will continue to work your way up many more large rocky steps as shown to the left until you get to Consultation Lake (frozen middle left side portion of the photo to the right). Consultation Lake is only about a half mile from Trail Camp so if that is your destination for the day, you are nearly there. The shores of Consultation Lake are desolate indeed, and very few Whitney hikers take the time out to visit this barren lake. But if you want solitude or just want to get away from the crowds of people in the more established camps, then Consultation Lake may just be your ticket. As soon as the scene to the left comes into view you can be assured that Trail Camp is very close by. This camp is one of the most crowed backpacking campsites in all the Sierra Nevada. 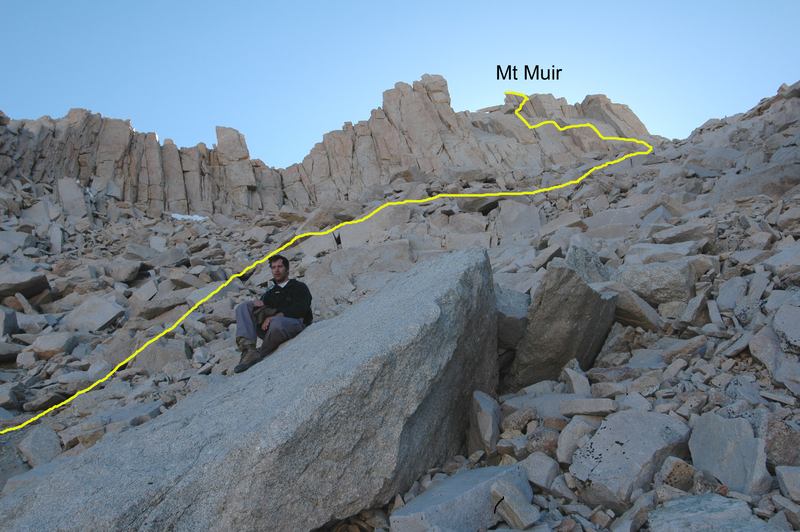 Most people who backpack Mt Whitney to reach the summit use this camp as a launching point for reaching the top. Trail Camp is located at 12,000 feet elevation and 6 miles from the Whitney Portal parking lot. Lots of activity in and around Trail Camp. It once had a solar toilet but due to abuse (people putting trash in the toilets). After Trail Camp (image to the right), the trail begins the infamous switchbacks. The photo to the left shows the cables section just above Trail Camp. The trek from Trail Camp to Trail Crest gains altitude quickly and once at Trail Crest you only have 797 vertical feet to go in order to reach the summit. Many people worry about the cables section of the trail when hiking up Mt Whitney. As you can see in the above left hand photo, snow and ice tend to collect at this point on the trail, and thus the need for the added safety of the cable railing. Stones have also been placed here to raise the hiker above the water runoff that often turns into ice during the night. But even the cables can be rendered useless in early season, so check trail conditions if you plan on hiking Mt Whitney in spring or in early summer during years of heavy snowfall. Crampons and ice ax (and the knowledge of how to use them) may be necessary during these times. To the right you can see an Aerial Photograph that I took of the infamous 99 switchbacks that lead to Trail Crest. I suggest an early start to avoid the crowds and heat (during the summer months). Once you get to Trail Crest, you are within two and a half miles from the summit. This photo was taken in late may of 2013, and as you can see there is still a fair amount of snow even though we had a lower than normal snow pack that year. Many hikers that were carrying ice axes Glissaded down this steep section, but I would not recommend it. Very high speeds can be reached, and if there are rocks sticking up, you can be severely injured or even killed. So I would stick to the trail unless you are very experienced and know that the snow pack is deep enough for a safe decent via a glissade. 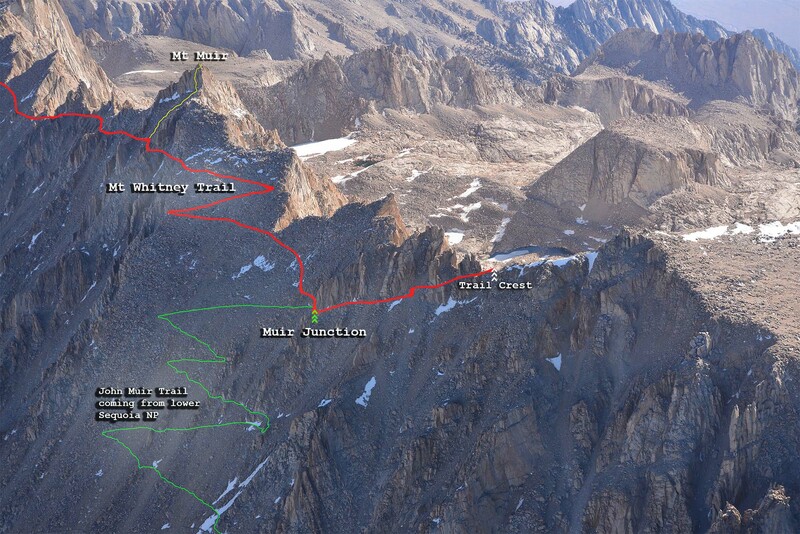 Trail Crest is your next destination after you have completed the 99 switchbacks, and as mentioned on the Mt Whitney Base Camp page, is one of the most beautiful scenes in all the Sierra Nevada as you can see in the upper right hand image. From Trail Crest you can see a good chunk of Sequoia National Park. You have now completed 8.2 miles of your one way 11 mile trek to the top of Mt Whitney. The elevation is now 13,700 feet above sea level. This is the official elevation despite the reading on the sign shown in the above left photo. It was placed there many years ago, and since then most authorities put the elevation a hundred feet higher. You are now entering Sequoia National Park. Mt Whitney itself lies within the park, and this section of the trail is shared by the famous John Muir Trail that starts out in Happy Isles Yosemite. There are 2.8 miles to go, and because you will be hiking well above 13,000 feet the whole way, it seems longer than it really is because you are breathing 1/3 less oxygen, and your heart is going to have to work extra hard keeping up with the demand that is placed on it by your muscles that are screaming for more oxygen. After Trail Crest, the trail descends a bit and then continues in a slight up and down pattern before making it's last turn upward before reaching the Summit. Not far from Trail Crest is the Mt Whitney Trail / John Muir Trail Junction. 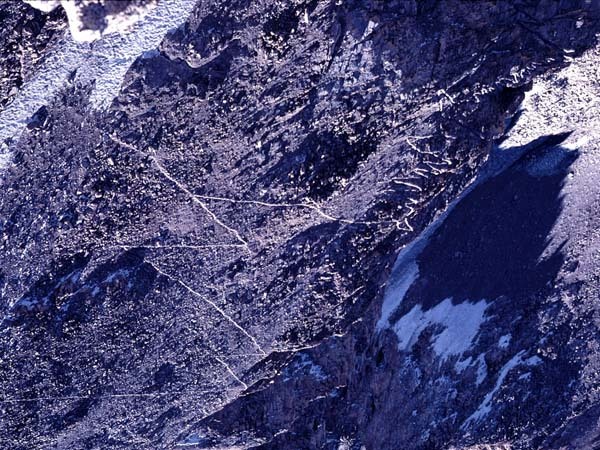 This famous junction is where Sequoia National Park hikers join the Main Mt Whitney Trail. From here it is a short distance to where you can turn off the main trail for a short scramble up Mt Muir if you want to bag another 14,000 foot peak if you feel up to it. This class three climb is a must for all those climbers out there working on completing all 15 of the California's 14ers. Doing Mt Muir in conjunction with Mt Whitney is an excellent way of knocking off two 14 thousand foot peaks in one outing. One of the biggest challenges is being able to recognize the exit point where you leave the trail. Most miss it and settle for just doing Mt Whitney which is perfectly fine. But if you do decide to do Mt Muir, be sure that you and your group are up to the challenge and have the necessary expertise. You can read more about this in the description below. The photo as seen to the right is the scene you need to watch for shortly after the above junction. But be warned if you are uncomfortable with high angle rock scrambling and a bit of technical climbing, do not attempt this adventure. A fall on Mt Muir is definitely a possibility, and there is a good chance that the fall could cause a very serious injury or even be fatal. As Mentioned above, Class three climbing is positively way beyond trail hiking and easy rock scrambling for most people. People who are experienced in rock climbing but not completely comfortable with exposure up high, should carry a rope and a few pieces of protection. The above yellow line shows the approximate route up Mt Muir. I always carry a small 8-9mm rope on all class three climbs for that extra bit of safety. Even if I may not need the rope in certain sections, others in my party may need the assistance, and it is always an extra source of safety on the descent. Getting off route is easy to do, and I cannot tell you how many times we have started off on class three rock only to get off course and end up on fourth or even fifth class rock before we were done. But as mentioned before, do not attempt this climb unless you are and the members of your party are experienced rock climbers. I find that 99 percent of all Mt Whitney hikers skip this side trip. To the left is a photograph that I took from the summit of Mt Muir showing the main Mt Whitney Trail switchbacks that occur between Trail Camp and Trail Crest. Mt Muir is a small summit, and only about three people can be on top at once. But the views from Muir's summit (14,015 feet above sea level) are outstanding in every direction. Mt Muir was named after John Muir, the famous conservationist. He was a Scottish-born American naturalist, author born in 1838, and an early champion of preservation of wilderness in the United States. His writings on his many adventures in nature (especially in the Sierra Nevada of California), have been read by multitudes of people. His efforts have helped to preserve Yosemite Valley, Sequoia National Park and other wilderness areas. Muir is also credited with being the founder of The Sierra Club. One of the best-known hiking trails in the U.S., the 211-mile John Muir Trail, was also named in his honor. Other places that are named after him include Muir Woods National Monument, Muir Beach, John Muir College, Mount Muir, Camp Muir and Muir Glacier. To the left you can see an Aerial Photo that I took from my climbing partners Light Weight Sport Aircraft in late May of 2013. It shows the Mt Whitney Trail in red along with the John Muir Trail in green that leads to the lower parts of Sequoia National Park. 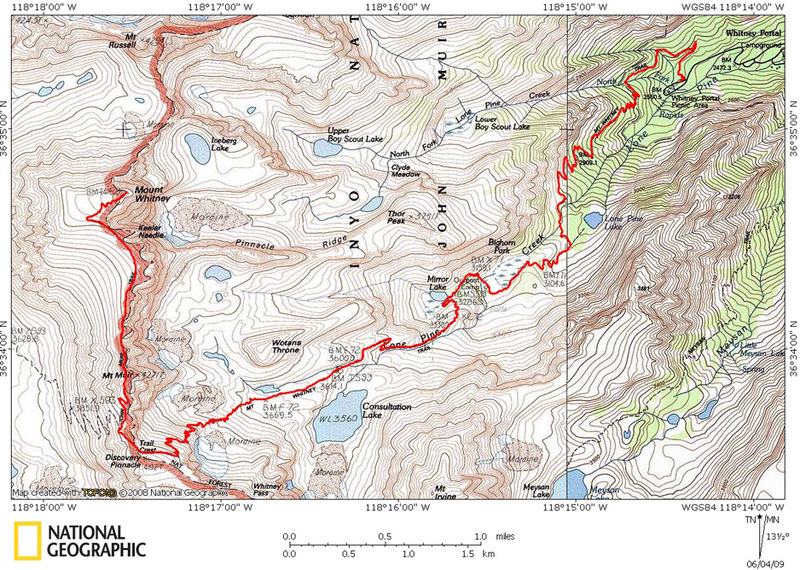 Also I have marked out the cutoff and route to the top of John Muir Trail. The image should give you a good idea of the main points of interest and forks in the trail on the backside of Mt Whitney. The 2.8 miles that go from Trail Crest to the Summit are not particularly steep, but it's the elevation that makes the last bit of the hike somewhat difficult. You have also put in quite a bit of effort to get to this point so most hikers are pretty tired. This is particularly true for those hardy individuals that choose to tackle Mt Whitney in a day. This is where altitude sickness can play the greatest role. This is where you and your friends need to pay even closer attention to the well being of each other. If someone is suffering from Acute Mountain Sickness, you need to get them down. People have died on Mt Whitney from AMS and it needs to be taken seriously at all times. Many rescues on Mt Whitney are due to severe cases of AMS. For more on this subject, please see our page on Acute Mountain Sickness (AMS). The Windows are another cool part about the Sequoia Side of the Mt Whitney Trail that you will be able to peer through as you pass by. Being able to see thousands of vertical feet below and far into the Owens Valley in the distance is a real thrill. But do not worry, unless you venture off the wide trail there is no chance of falling down the steep walls of the eastern escarpment. The trail seems to go on and on, but you will soon be able to see the little stone summit hut atop Mt Whitney. The view is a little unsettling at first, and the summit seems far off, but perseverance wins the day, and you will be on the summit before you know it. In the below photo that I also took from the air in late May of 2013, you see a good view of the Needles. They are an easy walk over from the Trail, but the view from down below is a different story. They are near vertical pillars of solid granite rock and are a real challenge to even the best of rock climbers. One last push at this point on the trail, and you will be on the Summit. You have now completed 11 miles on the Mt Whitney Trail and congratulations are in order. If your schedule permits, take time out to enjoy the 360 degree view. You are now standing on the highest point in the lower 48 states of the USA. You will no doubt be sharing your experience with people that come from all walks of life and with some that have come from very long distances in the US, or even from other countries. Interestingly, Crooks Peak as you can see in the center portion of the above image is named after Hulda Hoehn Crooks who was born on May 19, 1896 and passed away on November 23, 1997 at 101 years old. She was a long time resident of Loma Linda, California and a mountaineer who made her first ascent of Mt Whitney at the age of 65 in 1962. Hulda then went on to successfully climb Mt Whitney for a grand total of twenty three times between the ages of 65 and 91. In 1990, by an Act of Congress, Day Needle was renamed "Crooks Peak" in her honor. Also to her credit, she became the oldest woman to climb Mt Fuji in Japan at ninety one years old in 1987, and climbed 97 other peaks along with completing the 212 mile John Muir Trail. Those who knew her well, called her "Grandma Whitney"
The summit is a place to refuel your body if you are feeling well enough to eat. You still have the return trip to make and a little rest and fuel will go a long way in re-energizing your physical resources for the trip down. But if the weather looks threatening or if lightening is a threat, you need to vacate the summit immediately. Do not take refuge in the summit hut. There is no protection from lightening in the hut. You need to get down as fast and safely as possible if a storm is a possibility. The fact is, if you see a storm approaching and you are on your way to the summit, you need to turn back, no matter how close the summit may be. It is not worth your life. Well, that's about it for the Mt Whitney Trail. So if you have time, click the following link and go Back To The Top and check out the many other Mt Whitney Links. Of particular interest, is the Mt Whitney Aerial Slideshow which will give you a great overview of the peak and the surrounding areas from both the ground and the air. Also, don't forget to sign up for our Timberline Trails Newsletter available below. It will automatically give you a heads up via email when we have new features and updates on Timberline Trails.